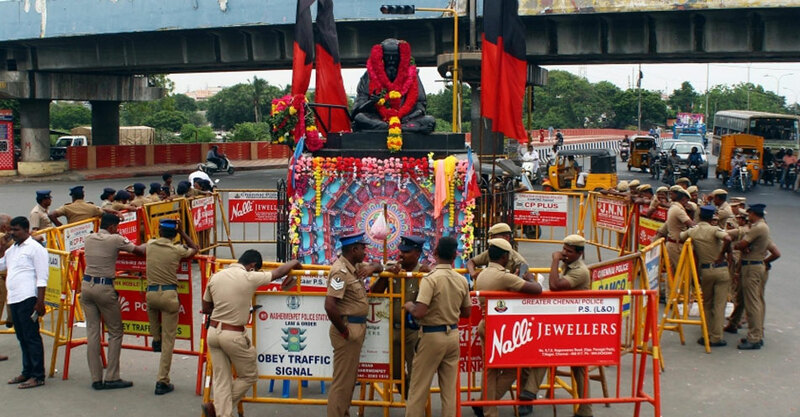 Tension prevailed on the arterial Anna Salai in the city on Monday, after the statue of Rationalist leader Periyar was desecrated by a miscreant on the occasion of his 140th birth anniversary, even as a similar incident took place in Tiruppur. Tension prevailed on the spot, as leaders of various parties and their supporters, who had come to garland his statue, managed to nab the miscreant. Reports received at the police headquarters here said, the statue of Periyar was also desecrated at Tiruppur, when a miscreant had placed a chappal on his statue. However, police intervened in time and removed it. A search was on to nab the culprit for offending the statue of the late leader. In Chennai city, at the time of the incident, VCK leader Thol Thirumavalavan had come to garland the statue located near Simpson junction on the Anna Salai, when the miscreant, who came in a two wheeler, hurled his chappal at the statue and shouted slogans. VCK supporters immediately nabbed him and attacked the miscreant. However, police interevened, arrested him and took him to a police station. Tension prevailed in the area as Mr Thirumavalavan and his supporters staged a snap agitation condemning the incident. However, they dispersed later after police assured them prompt action against the culprit. Leaders of various political parties, including the ruling AIADMK and the Opposition DMK, condemned the incident and demanded stern action against the miscreant. Tamil Nadu Fisheries Minister D Jayakumar condemned the incident and said such acts would not be tolerated. ”Insulting the statue of Periyar is akin to insulting the people of Tamil Nadu”, he said and promised that necessary action would be taken against the culprit. DMK President and Opposition leader M K Stalin strongly condemned the incident and demanded the arrest of the culprit under the National Security Act (NSA). In a statement here, he said, on a day when Periyar’s birth anniversary was being celebrated to pay their gratitude for ensuring social justice and self-respect, some narrow minded perons, in the name of insulting Periyar, was indulging in such barbaric acts to disrupt peae in the state. Strongly condemning the desecration of Periyar statues at Tiruppur and Chennai, Mr Stalin said some communal forces were behind such incident. He said such efforts to disturb peace, communal harmony and social justice in the state should be nipped in the bud and demanded the arrest of the culprits under the NSA. Meanwhile, floral tributes were paid to the late Rationalist leader on the occasion of his birth anniversary, with the Chief Minister, Deputy Chief Minister, Ministers and leaders of various political parties garlanding his statue to mark the occasion.